The painting by the German artist Hans von Aachen “The Allegory of Peace, Art and Abundance” is a vivid example of the complex and sometimes contradictory art of Mannerism. Painters of that time were interested in ideas and themes of a mythological, religious and allegorical nature. Because scholastic ideas and the way of thinking come into contact with naive fantasies and begins interpenetrating each other, creating a special means of representation when an abstract concept is transmitted with the help of a real character. Most often these are allegorical images of peace and war, love and hatred, justice and discord, fame and shame are portrayed as human beings. The canvas “Allegory of Peace, Art and Abundance” with its name and appearance proclaims the basic principles of Mannerism. First of all, it is an allegory – how important philosophical and moral categories would look if they had acquired a human form, how they behaved. These three ideas Hans von Aachen represents in the form of three female figures. On the couch, slightly covered in a thin snow-white sheet, the naked red-haired woman who embodies the World is lying down. Her hair is collected, and the only decoration is an unusual golden pendant covering the solar plexus. It is held not so much by a thin chain that descends to the pendant from the neck of a woman, but thanks to two golden wide ribbons that surround the central female figure under the breast. In her raised hand is an olive branch – the ancient Greek symbol of the world, the pose is relaxed and peaceful, with her feet she tramples spears, arrows, shields, iron armor and battle drums, and the viewer understands that the world reigns for a long time. In the foreground is another woman – kneeling and half-naked – which is turned to the viewer’s back. The lower part of the body is wrapped in a golden fabric, and the hairstyle with many braided braids is decorated with an intricate hairpin. In her hand, stretched to a naked woman, a dark-haired servant holds a full bowl of light red wine. This is a metaphorical depiction of the cornucopia that helps the viewer to perceive the image as the personification of Abundance. Behind the World, in the penumbra of the room, is another dark-haired woman, completely clothed and less beautiful in appearance. The imagination of Hans von Aachen so represents Art – in dark, bluish-green robes, a blood-red cloak and with a sphere in his hands holding Mir on his shoulder. Art hides behind the back of a naked woman, as if defending it. To a certain extent, the painter grasps the idea that Art is possible only when the World reigns. 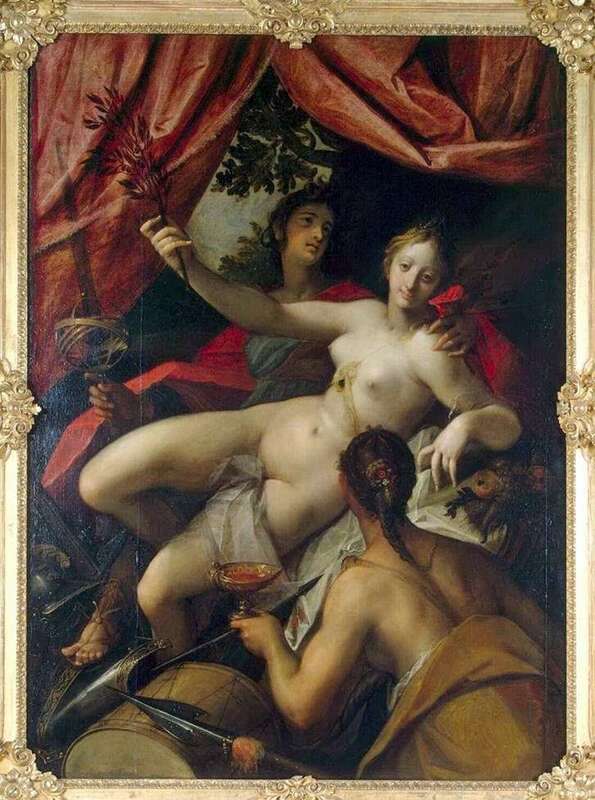 Description and meaning of the painting Allegory of Peace, Art and Abundance by Hans von Aachen.